As hoped for today was a beautiful, mild sunny day and I scratched the itch I had to add to my series of small "Farmhouse" paintings. This was a real quickie but knowing the subject so well allows me to execute the paintings in short order. 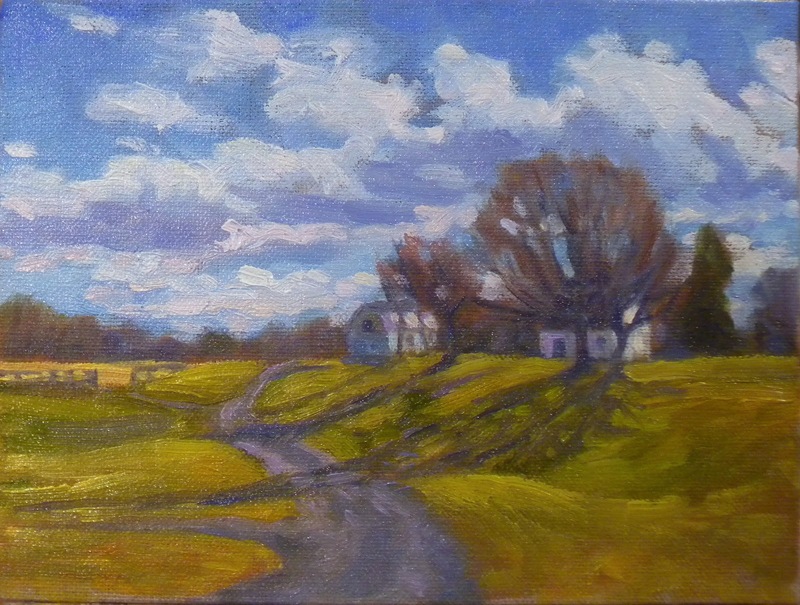 I think I might add different views of the farmhouse as I don't want to get too repetitive in the same season. I like the view from all directions so I will see what a different perspective brings. At least this is helping me learn to enjoy painting winter landscapes. I had mentioned in an earlier post that without snow to paint in winter I have found it difficult to work up much enthusiasm to paint what I see. It boiled down to the fact that I don't feel I do leafless trees very well. I am beginning to develop ways to tackle them. Squinting to see the tree as a mass with subtle variations in color from the densely branched centers to the finely branched tops I put those colors down in broad strokes. Then I work the sky back into them just as I do sky holes when the trees are in leaf but there are more and the openings are more elongated. I am having fun with them! I took a break indeed! I didn't realize my last post was on February 1st which just goes to prove how time flies! I have been busy and I have been away. I enjoy blogging but when time becomes a consideration I must put my journal on hold. I had planned on blogging from the Outer Banks while we were there but discovered that the problems I had with Blogger on this computer were now happening on my laptop. Go figure. When I read back through my posts I realized that I had never uploaded the finished version of "Above Cayuga's Waters" which you see here on the left. I tweaked it a little today and may make another minor adjustment. It was a dark and rainy day so I will wait for some bright natural light before making that decision. I didn't take my oils to the Outer Banks this trip but did bring watercolors and my sketch books. The next painting I do will be one inspired by Currituck Sound which is a favorite subject of mine. I also want to do a couple of beach paintings. Evening provided the most interesting moments especially on the dune overlooking the beach and the crashing waves. The surf was pink/gold where the sun hit it and lavender/turquoise where shaded. I did a sketch that shows the surf only and I am tempted to paint that in a large format like my paintings of the Great Falls in Virginia. The Patron's Show at the Art League in Alexandria is now over and I never posted about the experience, nor did I upload the five paintings I had in the show. The Patron's Show was one of the reasons I was too busy. All five paintings are off to new homes and I was very happy that one of them will be residing in the home of a good friend. This is Wednesday's painting. It was day two of an extraordinary warm up. The snow melted away on Tuesday and we enjoyed comfortable temperatures in the high 60's on into Wednesday. We didn't see much sun on this day, however, as a strong storm was on its way. The clouds painted here were the harbinger of that. Boy did it rain! I am hooked on the farmhouse. I don't plan on painting these little paintings everyday but I do plan to do some each month year round. I will finish next January. I think it will be interesting and I am already wondering how to frame and display them. 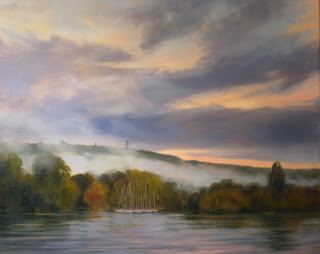 The winter paintings have been afternoon paintings but I can guarantee you that as soon as the temperature starts heading to triple digits again you will be seeing morning paintings. The light will then be coming from the left. There are plenty of scenes I could have chosen for this project but when I painted the first one of this series I wasn't thinking of continuing for the whole year. 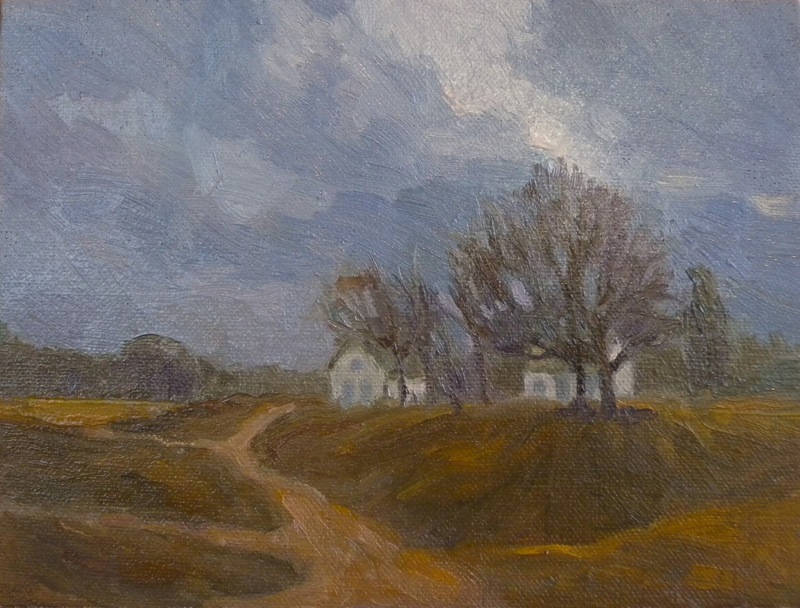 I selected this view because I see it everyday and have always loved the simplicity of that little farmhouse. The building on the left is only two years old and is a new storage barn. The house is quite old and fits the landscape perfectly. It sits at the highest point and creates a focal point from all the pastures. I am reminded of what I was taught when I studied landscape design. Find the genius loci of the place and design accordingly. This little house respects that.